Heat oven to 450°F. Bake pie crust as directed on box for One-Crust Baked Shell, using 9-inch glass pie plate. Cool on cooling rack 15 minutes. Meanwhile, in small bowl, beat cream cheese with electric mixer on medium speed until fluffy. In medium bowl, beat milk and pudding mix with electric mixer on medium speed until well blended. Add cream cheese; beat until smooth. Spread cream cheese-pudding mixture in shell. Refrigerate 1 hour. Top individual servings with blueberry pie filling; garnish with whipped topping and lemon peel. Cover and refrigerate any remaining pie. 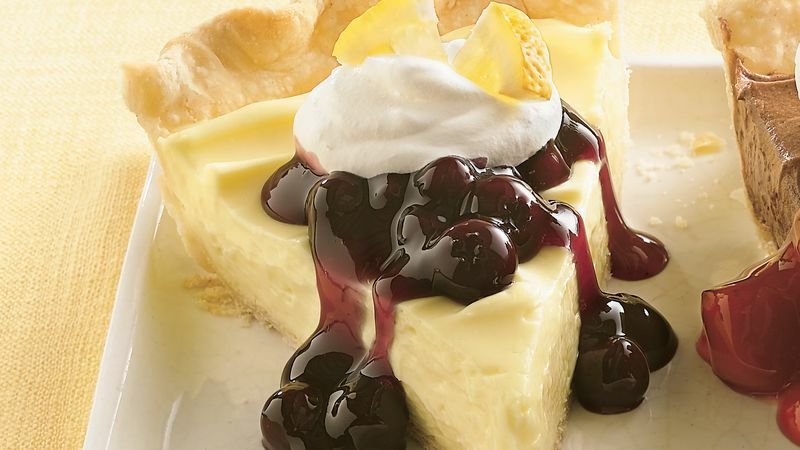 Chocolate Cream Cheese-Cherry Pie: Substitute chocolate instant pudding for the lemon, and cherry pie filling for the blueberry. Garnish with chocolate curls. Butterscotch Cream Cheese-Apple Pie: Substitute butterscotch instant pudding for the lemon, and apple pie filling for the blueberry. Garnish with fresh apple pieces. To make this pie a day ahead, prepare through step 3. Cover and refrigerate overnight; top as directed.